I think if we each make a point to read Post #1 before posting here, this sticky will not get so cluttered. +1, the ones I've built for cehowardGS were all 60cm frames and all 58cm TT. The 62 ctt that I am riding now has a TT that measures 57 ctc (surprised me too). I can get the contact points in the right place but I was hoping to find a Classic 60 with a 57 cm TT (like my Miami Vice) so that I would have a little more seat post and stem showing. Do the Classic 58s that you have measured have a 57cm ctc TT? Last edited by RobbieTunes; 12-09-18 at 07:19 PM. Is there a larger size image of this? Sorry I personally don't have a larger image. Its just something I came across stored on an old drive. 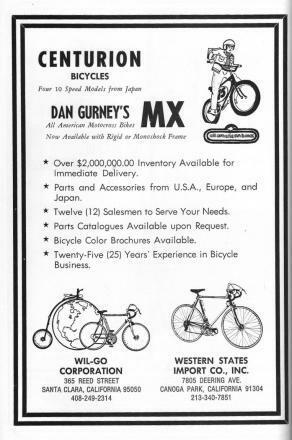 The Dan Gurney connection / BMX era being ramped up is neat. 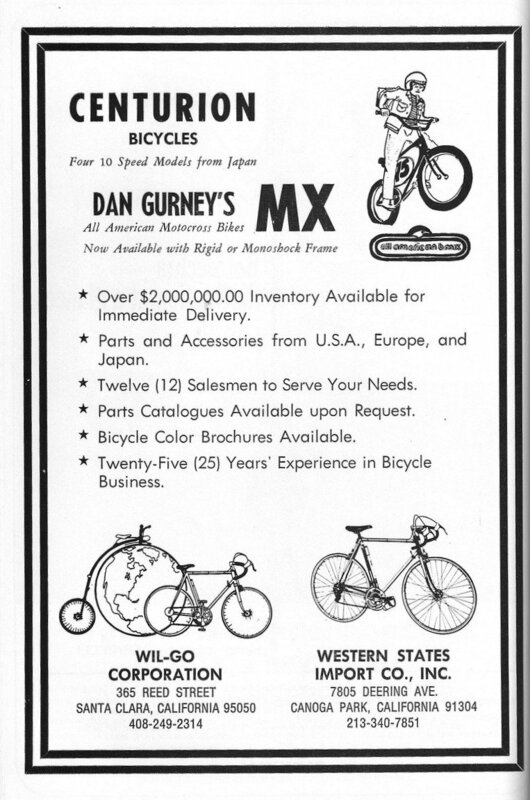 Old magazines are often worth it just for the adverts and history. Found another advertisement and learned how Mercedes first established US distribution using Studebaker dealers. Here's a link to a somewhat larger version. It's fairly clean for a jpg. It could be cleaned up with a one-click tool to remove jpg artifacts, adjusted and sharpened carefully, then resized to produce a poster sized version. Red/white 60cm 88 IM Expert was being disassembled earlier this afternoon. Disassembler noticed strange markings on BB cups and spindle. Upon closer inspection this was discovered. BB cups are Kajita brand. Spindle is SCM brand. Repeat, Kakita and SCM brand. Loose ball cup/cone with no bearing cages. Appears to be original. Be on the lookout, there could be others out there. Other related news: The bare frame/fork/headset combo weighed 6.90 lbs on a cheap Dr. Meter hanging scale. Last edited by seypat; 12-31-18 at 01:09 PM. Sheldon "loose ball" Brown would be proud . Could you provide me with the specs on that spindle? See if I have one to match. Thanks loads. The spindle length is 113mm. According to Sheldon's chart,(linked above by markwesti) the universal marking size is 3H. If you have a 3H in da casa, you are good to go. Last edited by seypat; 12-31-18 at 05:56 PM. I guess those 2 became suppliers in 1988. I have to admit, I can't put a spindle in without a plastic sleeve. If I don't have one, I make one from a disposable water bottle. Question for you experts. If everything on these bikes was metric and Japan was on the metric system why are the balls 1/4"? Surely if Japan could make everything else they could make bearings or is the worldwide standard for bearings in Imperial sizes? Identical to my '89 Ironman's Suntour GPX group bottom bracket. I expected to see caged bearings like my Univega's BB and headset but found loose bearings. No problem. I replaced 'em last week just for giggles, along with using Phil's grease. The BB didn't even need any servicing, the original grease and everything was still good, no indications of infiltration from water or debris. The rubber seals were still good and doing their job. The only thing I did differently was to eliminate as much slack as possible from the bearing cones without any grinding sensation. The original BB felt like the cones were snugged up about half a turn tighter than necessary. But, heck, it had lasted almost 30 years without pitting the races or deforming the ball bearings. The first time I rode my '89 the bottom bracket had a pretty loud clunk and I am hard of hearing. 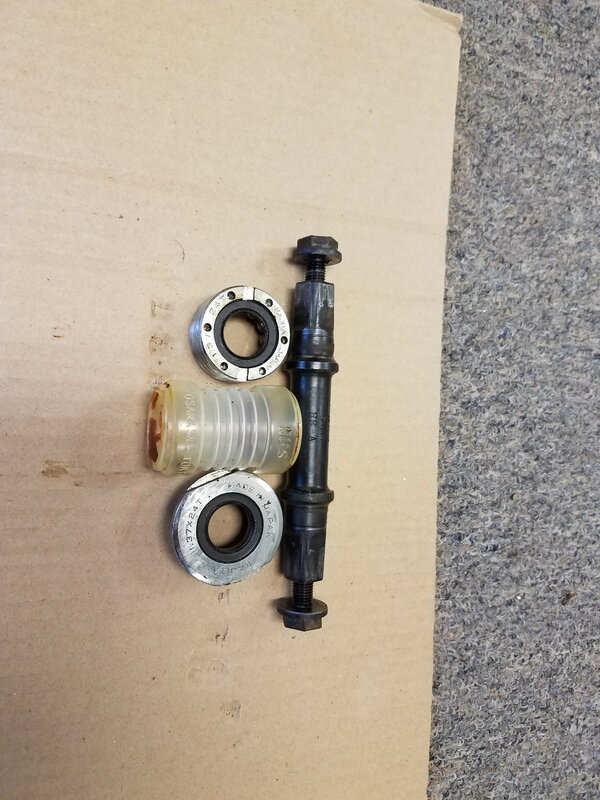 I figured the bearings were shot so I tore it down to see what I needed. The adjustable cup lock ring was good and tight but the fixed cup was loose. I repacked it & adjusted it right and it hasn't made a sound since. I'll bet it clunked since it was new 30 years ago. It would also drop the chain every time I went to little ring if the rear was in any of the three lowest gears. I adjusted the limit screw and its never done it again. From the wear on the chain rings its a very low mileage bike. I wonder if it was poor dealer prep? The first time I rode my '89 the bottom bracket had a pretty loud clunk and I am hard of hearing. 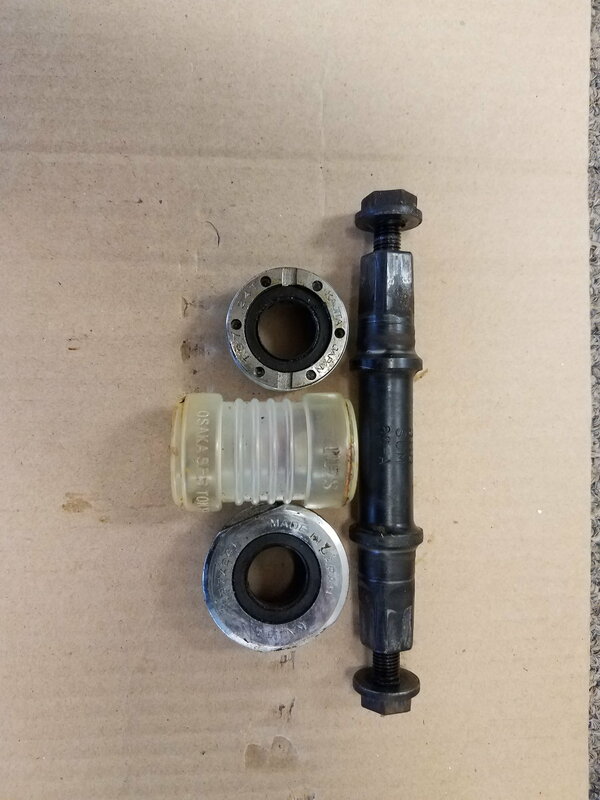 I figured the bearings were shot so I tore it down to see what I needed. The adjustable cup lock ring was good and tight but the fixed cup was loose. I repacked it & adjusted it right and it hasn't made a sound since. I'll bet it clunked since it was new 30 years ago. It would also drop the chain every time I went to little ring if the rear was in any of the three lowest gears. I adjusted the limit screw and its never done it again. From the wear on the chain rings its a very low mileage bike. I wonder if it was poor dealer prep? Check the front derailleur. Most tutorials for aligning the front derailleur recommend aligning the front plate of the FD cage with the big chainring where it's parallel. But this doesn't work with the GPX front derailleur. Suntour added a clever little bump, hump or knuckle to the inside of the inner plate on the FD. This helps nudge the chain onto the big ring without dropping, and helps keep the chain from dropping on downshifts to the little ring. Problem is, techs have to ignore the old advice for visually aligning the front derailleur. When I got my Ironman the front derailleur shifted perfectly. No chain drops. Then I noticed the FD was slightly askew. I "fixed" it. Big mistake. For months afterward I had to shift very carefully or risk chain drops. Recently when I had most of the bike disassembled I studied that GPX front derailleur carefully, comparing it with the three Shimano FDs on my other bikes. I realized why Suntour designed the GPX FD that way. I nudged the front derailleur nose-inward slightly, counter-clockwise, so it was slightly but visibly askew if you eyeball the outer plate of the FD against the big chainring. After that I only needed to tweak the low limit screw slightly. Now it shifts perfectly. But it looks wonky. Just like when I first got the bike. Before I "fixed" it. BTW, another bit of the GPX system that seems to be picky -- that long horizontal adjustable dropout. On my bike it really affects not only rear shifting but drivetrain tension and whether I can use the two smallest cogs while in the small chainring. A couple of weeks ago I completely removed the adjustable set screws from the dropouts because one screw was bent. I probably did that clumsily moving the Ironman on and off the Cycleops trainer. While the set screws were off the bike I decided to try the bike without those screws for awhile. Without the screws the rear wheel can be set fully back into the dropout. This helps clear the chain from the jockey wheels so there's no clatter in the smaller cogs while in the smallest chainring. It also reduced the chain sag -- I had left the chain a couple of links longer than usual just as an experiment to see how it affected drivetrain tension. The B-screw adjustment alone wasn't doing the trick. I'll try the bike a few times this week, but I suspect the sweet spot will be slightly forward of fully back in the dropout -- this will still be farther back than I could set the wheel if the set screws were installed. So I may need to either modify the screws by filing down the heads, or just leave them out and align the rear wheel by eye. So far the wheel hasn't slipped while riding, even when I stand to stomp the pedals for sprints and climbs. So those set screws in the dropouts may not be absolutely necessary. My ARX fd has that bump, and sure enough it doesn't work well with the cage parralel to the chain. My ARX and GPX are both shifting good now. Yes they are slightly askew but not enough to notice without really looking close. The lock ring wasn't the problem on my bottom bracket it was the drive side fixed cup. It wasn't even finger tight. My lock ring tool is a Park but its pretty new and still has sharp corners. If it gets so that it slips I'll get a Hozan. Last night I did manage to drop the chain once, using the trainer as a workstand without any resistance on the rear wheel. It happened only once out of several tries, and only with the chain on the third largest cog, while shifting down from the big chainring to the smaller. That's a fairly unusual combo so it shouldn't be a problem while riding. I usually shift from the small to large chainring or vice versa only in the three smallest cogs. Trying to reproduce the problem, it appears my chain is just a little too long, maybe one link. So when the rear derailleur snaps back to take up the slack there's some bounce before it settles down. If it becomes a problem during actual road rides I'll remove a link. Yeah, I got a Channel Lock adjustable wrench recently with sharper edges and thin jaws to tighten that cup. My thin stamped wrench had a little too much slop and slightly rounded edges so it wouldn't grip well enough to properly tighten the cup. The three I have are in the 120+ range. Could you save that bb for me please? That was the one outstanding question from the very beginning.